Click on Add button present on the top left of the Projects screen. Select Project from the drop down. Note: You can also create Templates from here. To know more click here. Enter the Title and Description of the project. 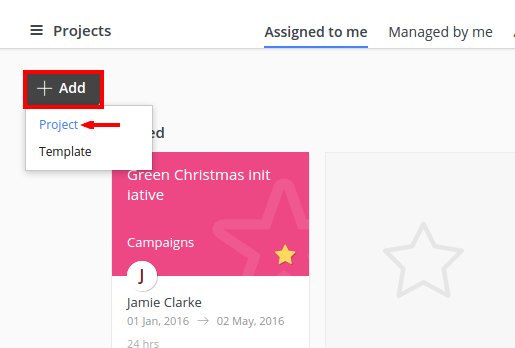 You can also select people you wish to assign the project. 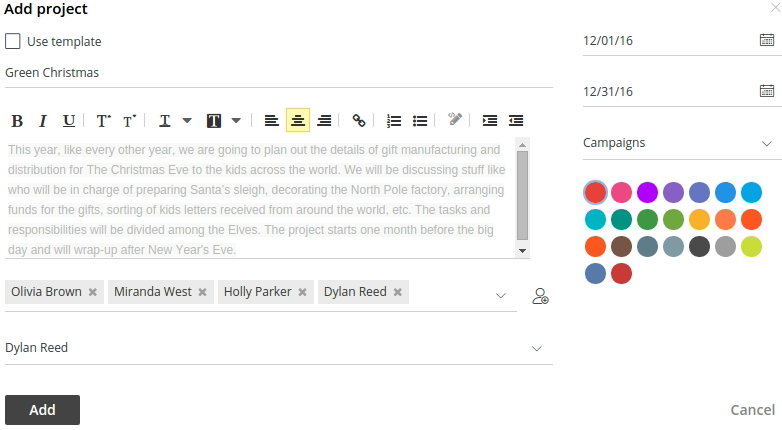 You can assign the project to the whole group at once. To add a new person to the account click on Add person icon. Fill in the details and click on Add. Select a manager from the list of people working on the project. Manager can always stay updated with all the ongoing progress by turning on the Project progress report. The manager will get the report of all the pending tasks, milestones, time logged and other activities in the project. Enter the start and due date of the project. Select a category of the project. You can also create your own categories. Learn more. Color code the project and then click Add.